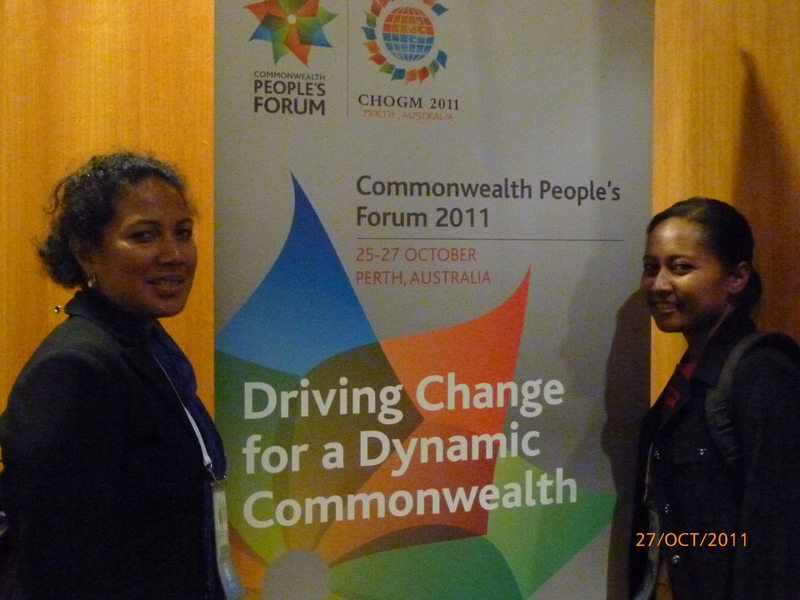 Jenta Tau, Programme Associate, Young Women, from the YWCA of Solomon Islands She shares with us her thoughts and her experience from Perth, Australia., where she attended the Commonwealth Peoples Forum in October 2011 . On October 25 – 27, 2011, I was one of the young women YWCA Delegates who participated in the Commonwealth Peoples Forum. This Forum is held every two years in the lead up to the Commonwealth Head of Government Meeting (CHOGM), held this year in Perth, Australia. The event, which gathered more than 300 people representing different civil society organisations within the 54 countries which make up the Commonwealth, was amazing! To be able to participate in the discussions, debates and deliberations of the key issues affecting civil society was a very valuable experience. With clear and strategic objectives, civil society organisations (CSOs) in the Commonwealth aim to: raise the visibility of CSOs within in the Commonwealth; create partnerships in the quest for development and democracy, and meaningfully look into ways and opportunities on how to strengthen the links between Commonwealth civil society organisations. The Forum also created the much needed space for dialogue between civil society and government ministers on the priority issues of the Commonwealth. It provided opportunities for that dialogue to be raised and addressed at the Commonwealth Head of Government Meetings. In line with the Forum objectives, 8 key priority issues were strongly debated and highlighted. These key issues were addressed in parallel workshops which were composed of experts who shared their experiences, best practices and realities within their organisations and communities. Gender and HIV/AIDS, which also inline with the World YWCA thematic. The Café Session closely explored examples of partnerships that have succeeded in mobilising civil society and how this links up to the Commonwealth Plan of Action work in terms of its resources, policies, institution. What needs to change in terms of laws and best practices in order to enable partnerships like this to work was also identified during this session. Participants looked into ways of sharing information and best practices and learning from individual leaders, enabling the environment and commonwealth institutions/organisations to share and implement this at the national levels. The Café Sessions also facilitated the identification of how and what Commonwealth member states and Commonwealth bodies need to do in order to enable such partnerships. Participating in Commonwealth Peoples Forum was an interesting and eye-opening experience for me. In addition being given the opportunity to facilitate, observe and learn from the other participants and share my experiences and reflections with them was invaluable. Some of the points that were captured from the discussions were the development of a Memorandum of Understanding and services within CSOs and mobilising resources through the alliances between CSOs, as well as developing a mentoring body within the Commonwealth members will be very helpful. Reflecting and observing the reality of the different classes that exist within the Commonwealth, it was called upon to eliminate such differences so that equality be emphasised within the Commonwealth.